Durham, NC: Durham is the home of Duke University, just miles down the road from its rival UNC, and is known as the “City of Medicine” & “Bull City”. 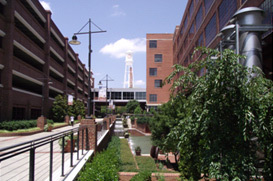 Durham has a growing downtown area with the revitalization of the American Tobacco Historic District right next to the Durham Bulls stadium. Durham has been ranked as the 23rd Best Place for Business & Careers by Forbes magazine (April 2010) and the 4th Most Affordable City in America by NBC’s Today Show (March 2010). Durham is located Northwest of the RTP area in Durham county.